This is Part 3 of Kerala Houseboats – The Essential Guide. In Part 1 we explained what Kerala houseboats are, and in Part 2 we let you know what to expect on a houseboat trip (including delicious food!). Now find out what you’ll see on your houseboat journey. What will I see on Kerala houseboats? One of the joys of a houseboat trip is escaping the dust, noise and hassle of other parts of India, and immersing yourself in the lush, emerald watery world of the backwaters. The tropical scenery is stunning – we never tired of it. You’ll float past riverbanks lined with abundant green palm and coconut trees, verdant paddy fields, and colourful waterlillies and lotuses. You’ll emerge from narrow rivers and canals into expansive lagoons, before returning to smaller waterways. The backwaters support a unique ecosystem resulting in a huge range of wonderful birdlife. We aren’t bird spotting experts at all, but were amazed by the number of majestic eagles and blue kingfishers we saw along the way. You can also see woodpeckers, Malabar hornbills, cormorants, darters, plovers, and brahminy kites. The highlight of the trip, and the reason you can’t get bored on Kerala houseboats, is the ordinary village life you’ll witness along the way. You’ll pass by women in brightly coloured saris washing clothes in the river and beating them on rocks. You’ll see fishermen in lunghis launching nets, dugout canoes overflowing with freshly picked coconuts, and grinning children waving hello. It’s a fascinating insight into backwater life. What will I hear on Kerala Houseboats? 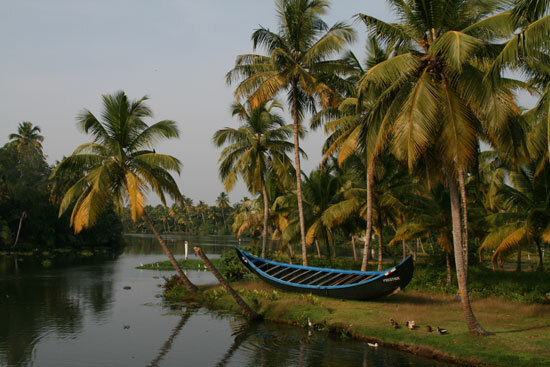 The backwaters are an interesting mix of Christian, Hindu and Muslim cultures. At different times of day you may well hear the call to prayer, Christian hymns, and Hindu chants. The only other thing you’re likely to hear is the sound of cheerful children trying out their English on you. Leave a comment and let us know what you saw and heard on your houseboat trip. Part 4 of Kerala Houseboats – The Essential Guide focuses on the practical aspects of how to book a houseboat trip and how much it will cost. Sign up to our RSS Feed to receive new articles direct to your reader. This entry was posted on Friday, August 28th, 2009 at 4:46 pm	and is filed under Kerala Houseboats, Kerala India Travel. You can follow any responses to this entry through the RSS 2.0 feed. Both comments and pings are currently closed.